As camera-tooting visitors to Cambodia are drawn to the soaring temple of Angkor, the world’s top photo journalists pass on their craft to the next generation. The 19th-century French naturalist Henri Mouhot was among the first explorers in the modern era to marvel at the majestic temples of the ancient Khmer empire (802–1431), some of which he found crumbling beneath a dense canopy of banyan trees and tropical vines in northern Cambodia. Mouhot is credited with discovering Angkor, which 900 years ago may have been inhabited by half a million people. Of course the 1,160-square-mile Angkor, which contains more than 90 major temples and other buildings, was never totally lost, and several Europeans carved paths to the remote shrines before Mouhot. Yet the young French explorer did much to popularize what is widely regarded as an ancient world wonder. In recent years, millions of travelers have followed in Mouhot’s footsteps, cameras in hand to shoot Angkor Wat at sunset, touring temples, libraries, and fields still sustained by 900-year-old moats. Visitors still travel on the very same stone roads and bridges that once linked this Khmer capital to an empire that stretched to Myanmar, Vietnam, and Thailand. Many fly directly to the international airport in nearby Siem Reap, a riverside town featuring fine Cambodian cuisine, which is often likened to Thai food but tends to be more sour than spicy. Scores of restaurants like Abacus Café and Madame Butterfly, set in renovated traditional wooden houses, have revived traditional recipes, as well as concocted daring Khmer fusion dishes. Siem Reap also lays claim to considerable sophistication, evidenced by the presence of the 24-suite Amansara, a member of Amanresorts. Fashioned from King Norodom Sihanouk’s guesthouse, Amansara features a spa and one of the chain’s signature slate-surfaced pools. Siem Reap has emerged as a bustling regional arts center. A dozen local galleries have created art walks. Free guides to the various walks are available from the McDermott Gallery, run by John McDermott, a local photographer regarded as the Ansel Adams of Angkor. Picking out the star photographer from the crowds at the Angkor Photography Festival, held amid the locale’s ancient temples, is surprisingly easy. The six-foot, five-inch Gary Knight would stand out in any crowd. Famous for his fearless coverage of the world’s worst conflicts, from Bosnia to Darfur, Knight helped found the festival. For scores of young photographers like Bangkok’s Satirat Dam-ampai, the Angkor Photography Festival offers them the rare chance to mingle with and be mentored by their idols. “I came here because these are legends, and you can learn so much from them,” she says. Growth of Siem Reap has come only in the last decade or so, according to Richard Yap, former manager of the Raffles Grand Hotel d’Angkor, a dazzling colonial-era property that played host to the early temple explorers of the 1930s. “The airport opened in 1997,” he recalls, “and it really took off.” Convenient to Angkor are more ruins, which are mostly blanketed in jungle. Tom Marchant, the founder of travel website Black Tomato, can organize a four-day itinerary that includes a sunrise tour of Angkor Wat; micro-lighting (motorized hang gliding) over the jungle; and a tour of Koh Ker, an ancient Khmer capital, that ends with an overnight stay in a private camp. That’s exactly what Knight wanted to accomplish when he first gathered here with some cherished colleagues: to experience something rare and distinctive in a mystical place, which is still as mystical as the site Mouhot came upon a century ago. This guest post was orignally published in Lexus Magazine. This is my first amateur attempt at producing a video in the form of a short documentary. The video showcases a few markets, bug eating, things to do, and other culinary adventures in Phnom Penh, Cambodia. It could still use some work, and I could work on my narrative, but it’s my debut attempt. If you have 10 minutes I would be grateful if you would check out this video and let me know your thoughts or ways to improve. Thanks a lot! I plan to start making other 10 minute or less documentary videos in different cities around the world. Thank you so much for watching and I would appreciate any feedback or suggestions! 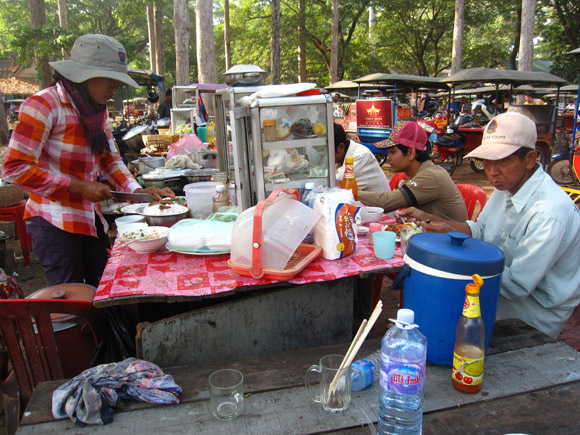 The tourist catered cuisine in Siem Reap near Angkor Wat, doesn’t always appeal by both taste and budget to a voracious food connoisseur. Fortunately, the local tuk tuk drivers who constantly transport tourists from temple to temple need to eat too. The driver’s laughed as they hinted that we would unquestionably get sick if we partook. Our general instincts and African experienced stomachs overruled the driver comments and soon our palettes were filled with a grilled pork cutlet over rice, and rice noodles suffocating in a delightful chili paste. The salty pork cutlet was expertly complimented by a cabbage and cucumber sour pickle and a sweet chili sauce. The noodles were equally pleasing and covered in an herbaceous chili sauce with the same accompanying pickle. Our stomachs held up and the dishes were a smashing delight!!! 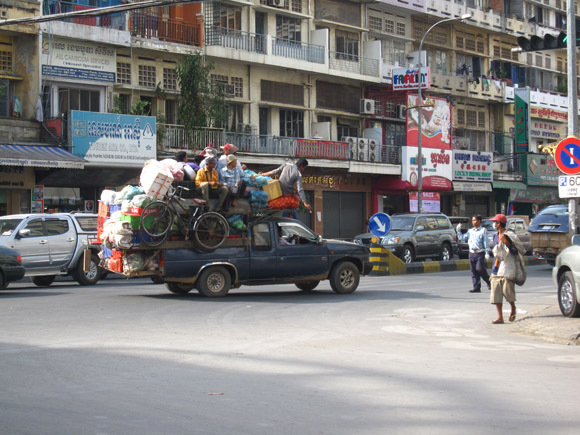 At times, Phnom Penh, Cambodia, can feel a bit hectic and maybe a little intimidating. I thoroughly enjoyed my stay and while there learned various survival tactics in order to make visiting Phnom Penh slightly easier and more manageable. Some of these survival tactics might even teach you a few lessons on how to be native in Cambodia. In any way, have an awesome time in Phnom Penh; a city that I consider to have a great mixture of entertainment, delicacies, humor, and great folks. It is utterly unavoidable that all operators of all forms of motorized transportation will pursue you for a ride. Motorcycles will pass, notice you are a foreigner, and then reverse in an attack to secure a job. If you say “no” they will smile and ask again as if you didn’t hear them, over and over. Survival: If you don’t want to eventually go slightly crazy, nod negatively with a friendly smile on your face continuously. Most locals in Phnom Penh are genuinely friendly and more than willing to converse. Around the main tourist sector some of the touts have become a little dodgy but are still very friendly. 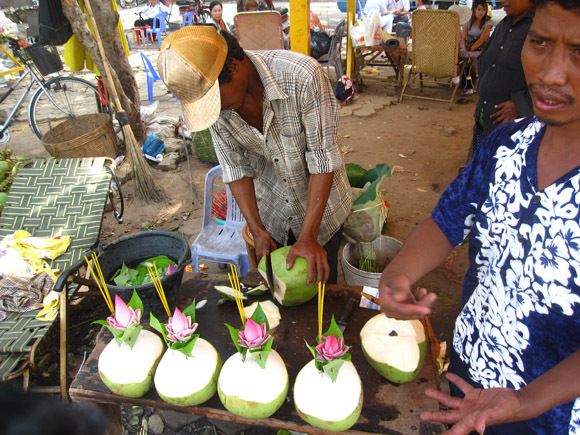 Survival: Avoid the tourist areas and chat or ask for advice from local Cambodians. Many are awesome to talk to and speak English surprisingly well. There are many beggars in Phnom Penh who hold out their hands and request some form of monetary currency, US Dollars being the most widely begged. I don’t particularly always support the giving of money as it can be highly misused. I however do support helping others if they really need a basic necessity. Survival: Have some form of food or snacks (bananas, nuts, jackfruit) readily available to distribute to the hands that ask for the US Dollars. At rush hour, there is an always present flow of steaming traffic with few traffic lights, leaving next to zero options to cross from side to side. One night I failed my brilliant idea to cross the street on foot by sprinting and then merging myself into the traffic…didn’t work. Survival: A group is the best way to cross the street. Stay huddled and move from one lane to the next (be in the middle). If you are alone, slowly proceed one step at a time. If someone is about to hit you, hold out your hand and always attempt to make eye contact. Get across the street slowly and cautiously. With the French influence (similar to relaxing in Vientiane Laos), coffee shops in Phnom Penh serving stout brews are abundant. When you order an afternoon coffee, a complimentary pot of Chinese tea is also served to you (or 6 pots in my case). Not a bad deal in my opinion. 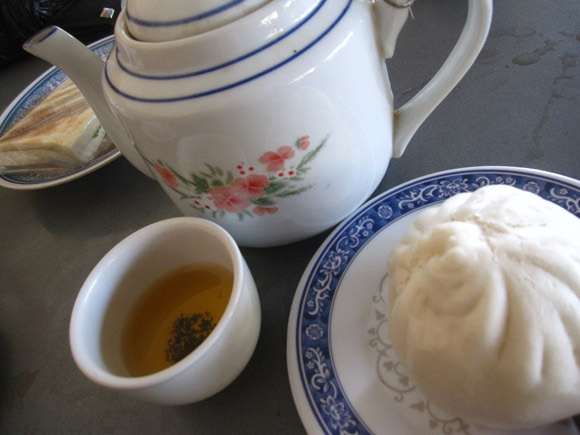 Many coffee shops will also offer bread or a delicious dim sum Chinese steamed bun known as Banh Bao which is a bit of a comfort food for me. Survival: To remain calm and collected amidst a backdrop of chaos, enjoy a quiet afternoon coffee and tea. The combination’s of caffeine will always result in positive effects. I frequented a place right across the street from the Russian Market where many coffee houses await. My stay in Phnom Penh was indeed a pleasant one and fit well within my designated budget. Around the Boeung Kak Lake, there are numerous guest houses offering satisfactory lodging options. I stayed at the No Problem guest house at the end of Street 93. Note: The lake is being developed and filled in with land and may not be around for too much longer. Survival: Get a room with a friend or two on the Boeung Kak lake front for about $4 and you most likely can sustain living life for quite a sum of time. I wasn’t going to let this article slip away without the mention of a few of the delicacies that are imperative to stuff. 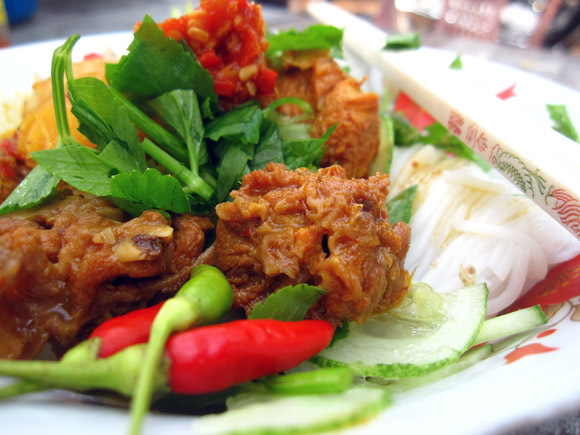 Local Cambodian food is exquisite and ranges from delicious ginger chicken to coconut fish curry and bitter melon pork. The sauces and chili sauces accompanying are equally seductive. Num Pang, or baguettes stuffed with pate, luncheon meat, vegetables, and sauces, are superb and resemble the Laos version of the sandwich. The famous tamarind juice from the Kandal Market was unbelievable. 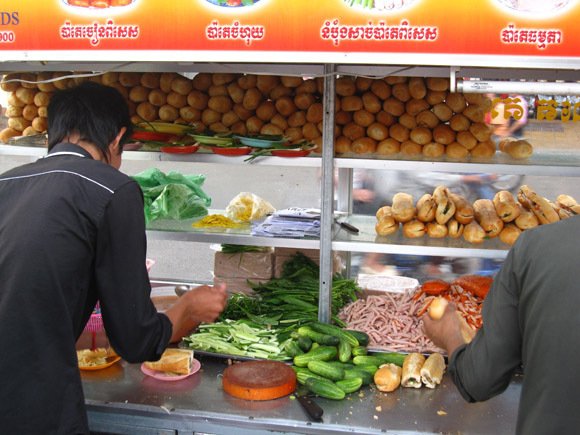 Num Pang (Baguette Sandwich)- Located all over the city. For an awesome experience go to the Wat Phnom Garden round-a-bout near the Cambodian-Japanese Friendship Bridge. Amok Trey- Stunning fish in a coconut blended curry. Find this dish all over the city. Cha Knyey- Braised chicken with pepper and loads of ginger. 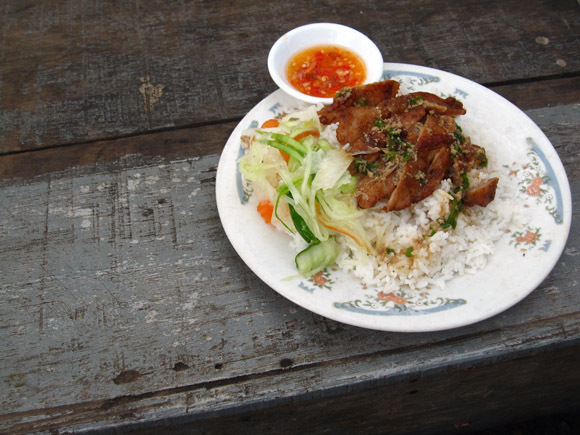 I ate this dish in the Old Market (Psah Chas). Nom Banhchok (Cambodia Noodles)- Rice noodles with vegetable and awesome sauce and chilies. Tamarind Juice: Get lost in Kandal Market and ask for it! 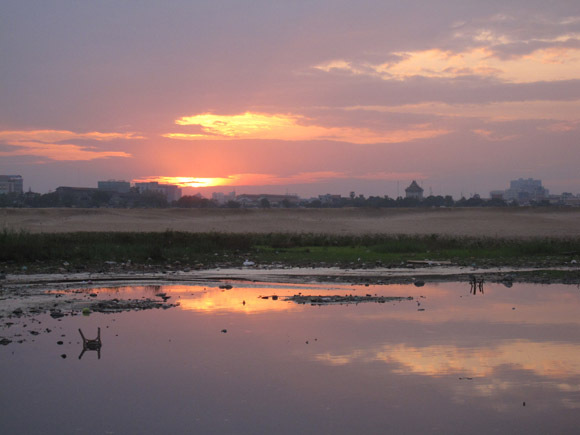 The afternoon sun in Phnom Penh penetrates with a brute force. It can dehydrate you and take advantage of you with haste. Don’t be a victim to the harsh rays. 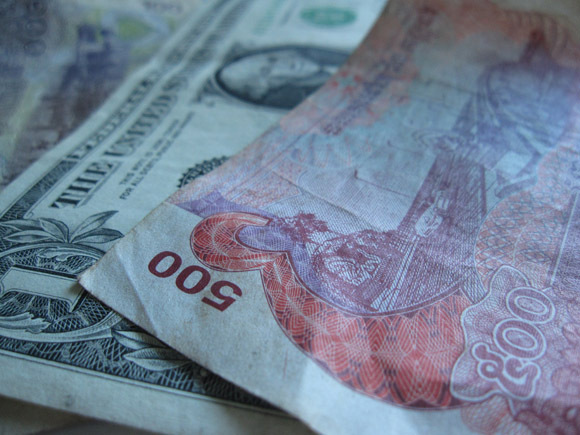 The US Dollar and Cambodian Riel (KHR) are interchangeable currencies in Cambodia. However, on the street, the exchange rate is lower than what local banks and exchanges offer. 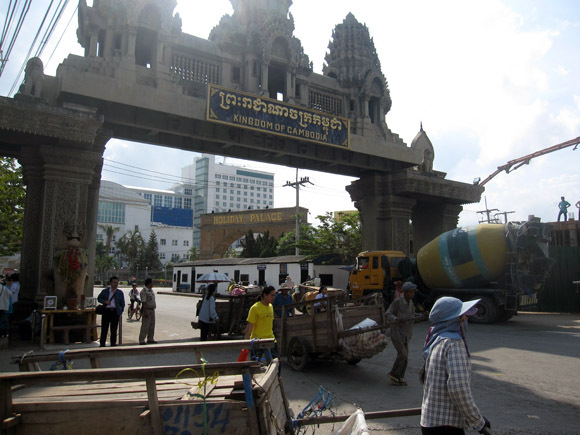 Migration Mark had a glorious time in Phnom Penh discovering awesome things and researching migrationology. With a time constraint in Cambodia, I was only able to allot a single day to the brilliant World Heritage Site of the Angkor Wat Temples near Siem Reap. I was able to see a significant amount of temples that were truly spectacular in complete regards. The single day really began on the evening before the day. We arrived to Siem Reap in the mid afternoon and tuk tuked our way to the entrance by around 5pm. If you arrive at 5pm, you can purchase your $20 single day ticket in the evening for the following day. That way you can observe the sunset at a temple of choice to get the slightest bit more bang for your buck. The next day began well before dawn with a massive congregation of camera flashing happy humans at the Angkor Wat Temple. The crimson sun rose, the cliche of tourist huddled together in awe and the stones glistened to reveal their antiquity. The antique towers of Angkor Wat were reminicent of Prambanan Temple in Indonesia, yet on much more significant foundation and overall larger structure. Walking around the temple was staggering. The stones are neatly fitted in place, the steps are steeply designed, and the carvings and reliefs are intricately carved. As I caressed the moldings with my naked fingertips, I could only marvel at the time and effort that normal humans put forth to create such aesthetic beauty. 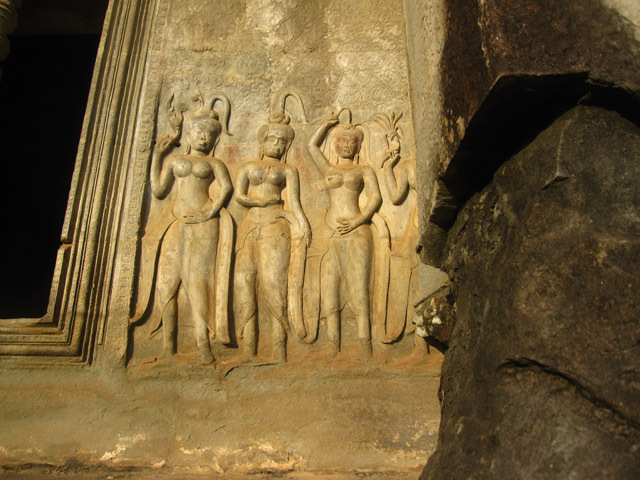 Many of the reliefs appeared similar to what I had seen at the Buddhist Borobudur Temple in Indonesia. A rush of a tuktuk ride and we were hurled towards the stunning Bayon Temple in it’s ruinous glory. This temple couldn’t help me from thinking that I was Socrates himeself in the midst of a philosophical genius of a thought. The temple emerges from a foundation of crumbling stones and rises with sets of posts and lintels and heaps of stone blocks. On entrance, one can observe ornate details of teachings and thoughts engraved into the lichen covered stones. By late morning we had arrived at the Preah Khan Temple. This temple seemed to continue on a single floor for a couple hundred meters as doorways lead to hallways and hallways opened into caverns. Thommanom and Chau Say Thevoda Temples were less impressive if compared with the others, yet still gorgeous in all manners without comparisons. The next temple was the Ta Keo. The steep and narrow steps lead directly to the summit for an incredible view and pleasant thigh burning hike to the top. 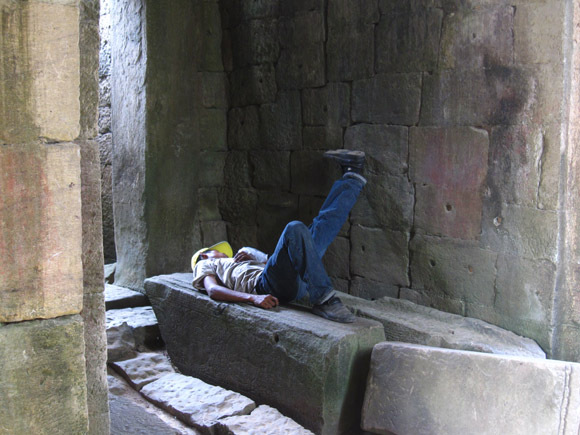 When the fatigue of my body began to kick in we proceeded to the famous Jungle Temple, also known as the Ta Prohm Temple. Though the masses also chose to visit it at our precise time, all was worth it. The vines and trees were holding the ancient blocks in place and binding the entirety of the temple together in a splendid view. In conclusion our tuk tuk driver shuttled us to the Banteay Kdei and Sras Srang Temples. As my buttocks sank into the comfy tuk tuk seat I didn’t really desire to get up and walk around any longer. I fought with comfort and forced my legs back into walking conciousness. Luckily the temples were not as impressive as all the former and 15 minutes was enough. As the sun sluggishly set over Angkor Wat, my aching thighs were relaxing and my mind was enthralled in ancient thought as I gushed back into the throne of the tuk tuk and felt like a Pharaoh. Allow your travels to eventually meander towards Siem Reap and the Temples of Angkor Wat. The architects and engineers were beyond their years and demonstrated the human ability of imagination, creativity, and construction skills. Though thousands of appreciative spectators have realized this too, it doesn’t miss direct the quality of such man made structure of extravaganza. When 2009 rolled in, I had just returned to the the United States from Patagonia to attend my sisters wedding in Phoenix, Arizona. It was in February 2009 under the influence of a carne asada burrito that I decided it was time to record my migrationology travels in the form of online documentation. I knew next to nothing about the web world, (twitter was literally just the sound of a bird to me). Utilizing gallons of my parents coffee and my addiction to yerba mate from Argentina, along with free internet, I gave birth to Migrationology. Flew to Honolulu, Hawaii, along with buddy David Damron from Life Excursion for a few weeks to visit relatives, do nothing on beaches, and never resist copious amounts of food. Lopsidedly balanced Waiola Shave Ice and extremely fried Mitsu Ken Garlic Chicken with hikes to Koko Head Crater and Makapu’u Lighthouse. Treated myself to my debut fish spa massage which left me giggling like a 10 year old. Enjoyed the Northern island of Langkawi. Had my first enlightening experience with the King Of Fruits while I tackled the Durian buffet! Came face to face with orangutan’s in Bukit Lawang, Sumatra. 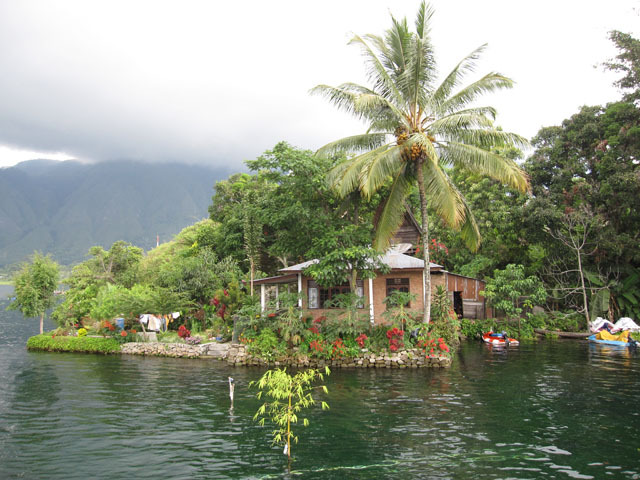 Experienced ultimate peaceful relaxing on the shores of volcanic Lake Toba in Sumatra. Climbed to the top of the deadly Mount Merapi Volcano on the island of Java, near Yogyakarta. Marveled at the impressive Hindu Prambanan Temple and Buddhist Borobudur Temple near Yogyakarta. Visited the Bali House of Life orphanage near Bali Cliff where we played games and football all day. Learned how to successfully drive a car in Indonesia. Aimlessly walked around and glamoured at the cleanliness and neatness of the manicured gardens and cityscapes. Couldn’t resist the Golden Mile food center or partaking of the famous chili crab and Singapore chicken rice. Became a millionaire for the price of $35.32 on the island of Palawan while sitting on private beaches and eating entire crabs by the mouthful. In Manila I was able to feast on fetus (balut) and 1 day old chickens that KFC can’t compare to. Volunteered with Gawad Kalinga to build houses with hope and heard powerful stories from people like Tita Silver while being immersed in Payatas. Hiked the most incredible rice terrace scenery from the Mayoyao Paradise rice terraces to the 2000 year old rice terraces of Batad with 116 levels. Couldn’t believe I was in South East Asia while spending time in the glorious evergreens and caves of astonishing Sagada. Thailand is where booty shaking in Bangkok and ghostride the tuk tuk with Thrilling Heroics and In Search of Sanuk emerged. Hung out with In Search of Sanuk by way of expending energy with awesome kids and celebrating with elderly folks. Little things make a difference when you relate and talk to others. The annual vegetarian festival in Bangkok proved to be much more delicious than it sounded at the time. Taught English at kids camps around Thailand and learned how to become an instant celebrity and get a little pay in the process. Celebrated Christmas in Bangkok with the company of wonderful friends and unbeatable Thai food! Learned how to make a Thailand visa run to Vientiane Laos. Hung out in the colonial French quaint town of Luang Prabang, relaxed by the river, read books, and shopped for the first time ever for souvenirs. Spent 2 delightful days relaxing on a slow boat while boating the Mekong River. Observed the most concrete structures I have seen in my life while spending 3 days in Hong Kong. Made conclusions about late night dim sum in Hong Kong while successfully attempting to eat unhealthy amounts of my favorite dumplings. Gawked at the amazing temples of Angkor Wat in Seam Reap (still gawking). Ushered in 2010 to the local countdown in Phnom Penh with fireworks and Khmer dancing and songs.